Evolution Motorsports Cat ByPass Pipes PORSCHE - Dezod Motorsports Inc - Home of the automotive performance enthusiast since 2002. All Cayenne Twin Turbo and Cayenne “S” models have 4 catalytic converters.The 2nd set is only to make to car extremely quiet – unnecessarily quiet. 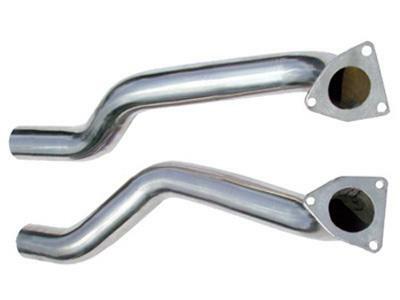 Evolution Motorsports Cat ByPass Pipes are for the second set of stock catalytic converters. Major Gains in power and throttle response. More V8 muscle car sound without being too loud. NO Check Engine Light no C.E.L. Passes emissions tests. More power +17 hp gain “S” and +27.6 HP Twin Turbo. Better than any German European systems 100% guaranteed. Taking off the useless 2nd set of 2ndary cats is 100% the most power. These cars DONT NEED backpressure. Polished mirror shine T304 Stainless Steel. Saves 35 lbs on the car.